​Each year, PennDOT uses nearly 1.6 million gallons of paint in its statewide line-painting operations. That's enough to fill nearly 2 ½ Olympic-sized swimming pools. Line painting begins in the spring and finishes in October. By then, our crews will have painted more than 114,000 miles of lines – enough to circle the globe nearly five times. Line painting is an extremely important part of our maintenance activities, as those yellow and white traffic lines help guide motorists along our state-maintained highways. 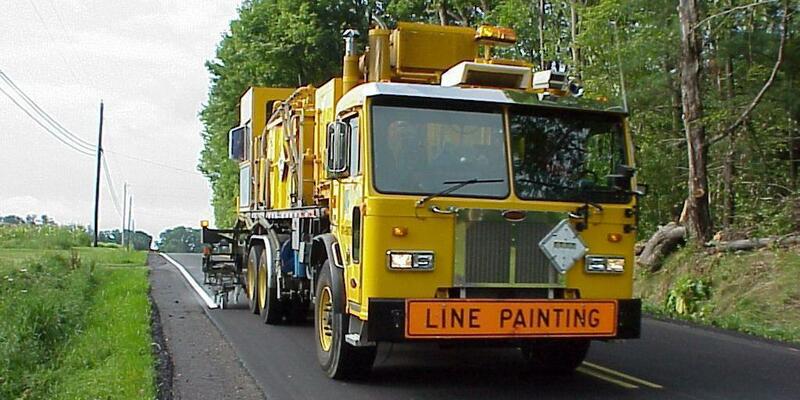 PennDOT paints primarily roadway center lines, lane lines, and edge lines but also paints timing bars for state police, directional markings, railroad crossings, and slow curve pavement markings. Unsure what various pavement markings mean? Review Chapter 2, page 22, of the Pennsylvania Driver's Manual (PDF) to learn more about Pennsylvania's most-common pavement markings. Paint that is used on Pennsylvania's highways actually contains beads made of recycled glass to provide retroreflectivity when it's dark. When applying the paint, our line painting crews' equipment heats the paint to about 110 degrees Fahrenheit and then sprays the material on the road. As the paint is applied to the roadway, glass beads are applied on top of the paint while it's still wet. We use approximately 11 million pounds of glass beads for line painting each year. When line painting, the weather must be warm and dry because rain, high humidity, or temperatures below 50 degrees Fahrenheit will increase the normal no-track drying time of between 90 and 120 seconds. If you still get paint on your vehicle, you may file a claim with the Commonwealth. Instructions can be found on the damage claims section of our website. Simply select the county in which the damage occurred, and then follow the procedures provided for line paint claims. Please note, however, that all claims are reviewed on a case-by-case basis and not all claims are honored as it is the vehicle operators' responsibility to operate their vehicle within the roadway lines and follow all warning and advisory signage. Learn more about how PennDOT paints lines and our other maintenance activities with our Maintenance First cards. Report potholes and other roadway concerns by calling 1-800-FIX-ROAD or by visiting customercare.penndot.gov.